Did y’all see the last minute Valentine’s Decor ideas I shared yesterday-my bloggy friends have some amazing projects you still have time to make! As for me, I’m ready to focus on the tastier side of the holiday! Do you have your Valentine’s Day treats ready to go? My boys and I spent yesterday afternoon making some sweets for my oldest to take to his Kindergarten friends on Thursday. 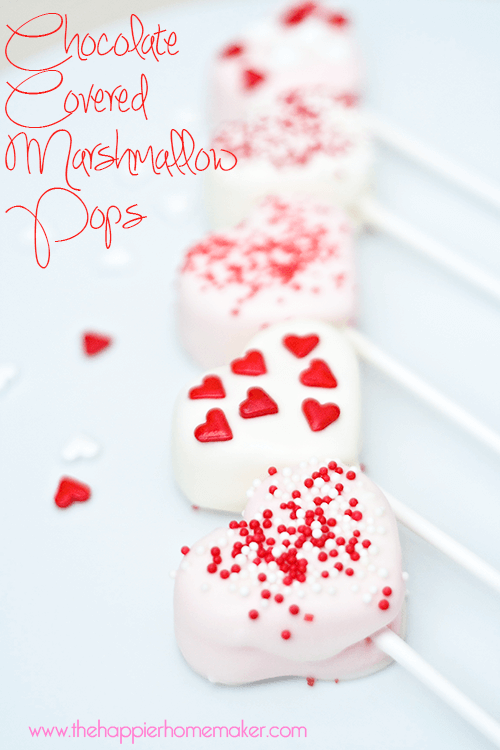 Marshmallows are the gold standard in treats over here so we made chocolate covered marshmallow pops! These were super easy-so easy the my six and four year olds were able to make them all on their own! Place your Almond Bark bar in a microwave safe bowl and add the vegetable shortening. Microwave for 90 seconds and stir. Continue to microwave in 15 second interevals stirring in between until smooth. In the meantime prepare your pops by inserting the lollipop sticks into the bottom of each marshamllow. Place in the fridge for ten minutes to set chocolate and you’re done! I used Wilton Pop Treat bags to cover the ones that Jack will be taking to school on Thursday and they worked out great. I think his classmates will really like them…and we may have made quite a few extras for ourselves! What are your favorite treats to make on Valentine’s Day? Have you checked out my Strawberry Heart Cheesecake Bites? They’d be perfect to make this week as well! And don’t forget to check out my Valentine’s Day crayon printable if you prefer non-food Valentines as well! Nom nom nom these look so good! I don’t even like marshmallow but I would totally tear these up! These are very cute and I’ll bet they will be a big hit with the children! Pinning and thanks for sharing…have a juice Valentine’s Day! Gimme some sugar!!! So sweet and pretty…perfect! Cute! 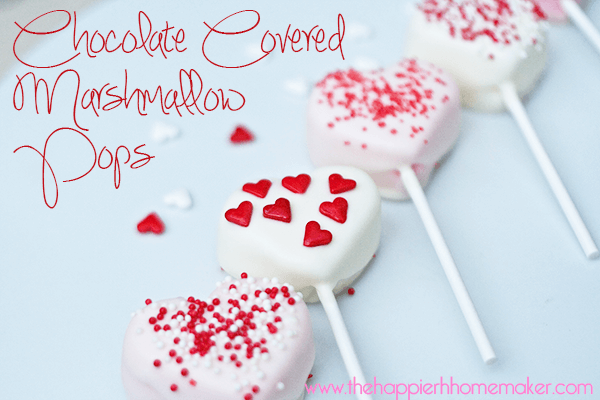 Our homeschool Valentines party is postponed due to illness with a family, but I am definitely putting this one on the list for treats. I’m over cake pops, these look fun! SO cute and easy peasy! I bet I could even lure my boys in with marshmallows and chocolate! So cute! I didn’t even know marshmallows came in heart shapes. THANKS! Thanks!! My boys ate them up and they were a big hit at my oldest’s school! These are so cute! I love the heart sprinkles – so fun! Thanks for sharing! Thanks Rebecca…I’ve had a bit of a sprinkle addiction lately, I keep buying novelty ones every time I’m at Walmart! Thanks Kathie-I’ll try to hop over when I can get to my “big” computer tomorrow!